Do you remember at school there was that chubby kid at the end of the cross country run desperately trying not to be last? Well, I wasn’t that kid, oh ok, maybe I was. I hated running at school but now it’s one my favourite things to do. To be completely honest, it used to be one of my favourite things but alas is no longer, we’ll come back to that another time. Back in 2013 when the world was not as crazy as it is now, when politicians told the truth and unicorns roamed free… I digress. Let’s start again like sensible adults. It was 2013 and I was a regular Sunday morning runner in a small of club of super fit young Sikh runners and friends. 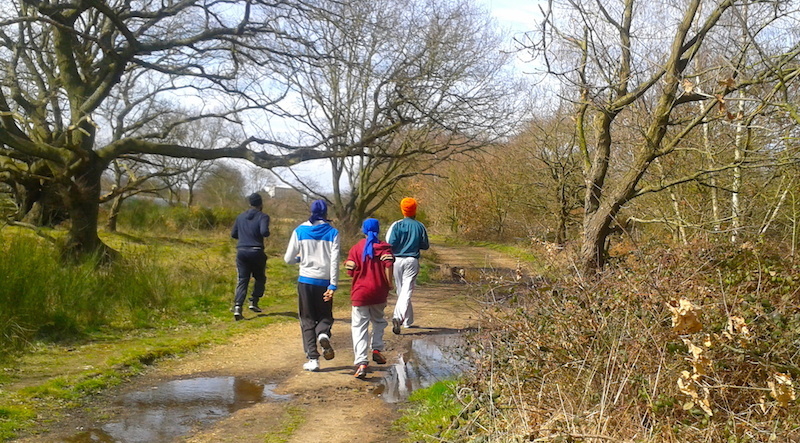 The super fit young Sikh runners and friends decided to enter an eight mile race for fun! Some people run long distances for fun. This baffles me a little. Eight miles is a long distance, it is! C’mon, Eminem made a film all about it. On the advice of the tres athletic Capoeira (the Brazilian gymnastic martial art) player, who was an occasional guest member of the running club, I (voluntarily!) decided that it would be great fun to run around Hampton Court Palace and its surrounding areas. She (the Capoeira player) is ridiculously strong, why was I was listening to her? I can’t do handstands the way she can. I question my decisions sometimes. I wasn’t raising money for charity or doing anything particularly noble – just plain old running eight miles on a Sunday morning one March day. When I did do the run the one remarkable thing about it was the abnormally cold temperature for that time of year. There was snow! The flaky dandruff type that makes you check your shoulders to see that you’re not shedding skin. The freezing like temperatures were handy as it meant all I could think about was my numb fingers and legs, so the running bit didn’t really come into my mind. My head was to busy trying to send blood to the extremities of my body. The few photos that I do have reveal a maniacal smile which I will also blame on the cold air. When I look back on that morning I do so with a grin as it reminds me that with the right mindset and a few encouraging (elite athlete) friends you really are capable of ANYTHING! And now for the science bit, as I like to educate and entertain – edutainment. Running is really good for you not only does it mean that you get to work on time because you didn’t miss the bus/train/tube (delete as appropriate), it can do wonders for your brain and competitive edge. There’s a very unique discipline that I developed during that eight mile run, namely ignoring that screaming voice in my head that was telling me to quit. I gritted my chattering teeth and just kept plodding on, even with the lycra clad professional runners who were near enough flying past me. I carried on! I was competing against myself. I against I, beating my personal best. This bit was easy, I had never ran an eight mile race before – I was already ‘ahead of the game’. Result! Running also increases the levels of positive hormones in the body for example the happy chemical of serotonin which helps regulate mood. According to Matt Fitzgerald author of Run: The Mind-Body Method of Running by Feel (I haven’t read it), in an interview with Women’s Health magazine he says, “Running puts the brain in an ‘alpha-wave’ state, which is associated with feelings of calmness and well-being.” I concur post-run I was deliriously happy and pretty bouncy. While two studies conducted by the University of Illinois found that participants improved their ability to solve problems by ten percent following 30 minutes of exercise. Go on crank up the dusty treadmill, or even grab the rusty bicycle and take it for a spin around the corner it’ll help to make you smart. This next study was my favourite bit of evidence in arguing the case for running. In 2012, the American Academy of Sports Medicine concluded that people who ran 20 miles weekly decreased their risk of death by 19 per cent, according to TheHeart.org. Running kind of makes you immortal. Excellent. 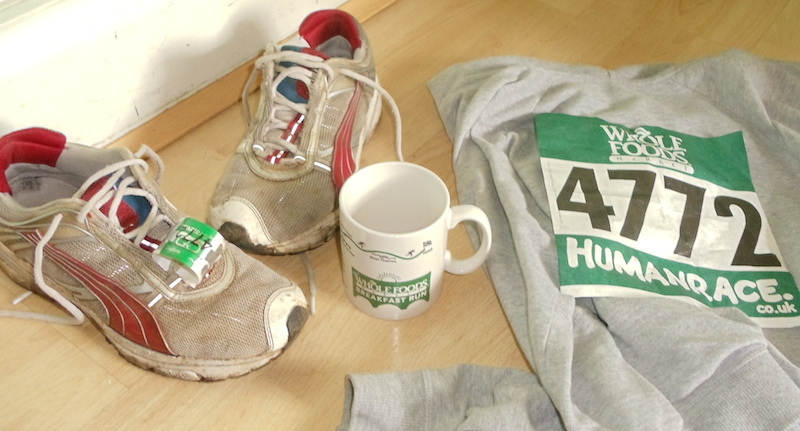 A running mug, dirty trainers (gross) and my number – I did it mum! I really did. It’s a shame that I no longer run but that’s another story.